Tatmadaw Battalion commander Bo Than Zin from Light Infantry Battalion #210 under Light Infantry Division #22 arbitrarily collected taxes from villagers who own wood processing machines in Lay Kay and Ler Hklaw villages. Because the KNU does not have the means to test for drugs, they fined drug users and drug traffickers based on information provided in the community. The KNU is trying to respond to an increase in drug use and trafficking. 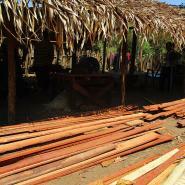 The KNU Township and District authorities gave permission to local people to log for wood in Bilin Township. This permission was revoked once wood was sent to Bilin Town, instead of being used by the local community. The following Situation Update was received by KHRG in March 2018. It was written by a community member in Thaton District who has been trained by KHRG to monitor human rights conditions. It is presented below translated exactly as originally written, save for minor edits for clarity and security.This report was received along with other information from Thaton District, including six other interviews and 102 photographs. On March 3rd 2018, the Tatmadaw collected taxes from villagers in Lay Kay village, Ler Hklaw village, P’Ya Raw village tract, Bilin Township, Thaton District. Tatmadaw Light Infantry Battalion (LIB) #210 under Light Infantry Division (LID) #22 arbitrarily collected taxes from the local community. LIB # 210 is led by Battalion Commander Bo Than Zin, and based in Lay Kay military camp. 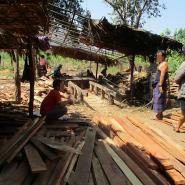 The Tatmadaw collected taxes from anyone who owned a wood chopping machine in Lay Kay and Ler Hklaw villages. In each of these villages, there are five wood chopping machines. The owner of each machine was arbitrarily taxed 100,000 kyat [USD 64.28]by the Tatmadaw. It was difficult for them to pay this amount. They begged the Tatmadaw to reduce the amount of the tax because it was beyond their means. The villager then negotiated with the Tatmadaw to reduce the taxes they required. The Tatmadaw ultimately ceded to this request. 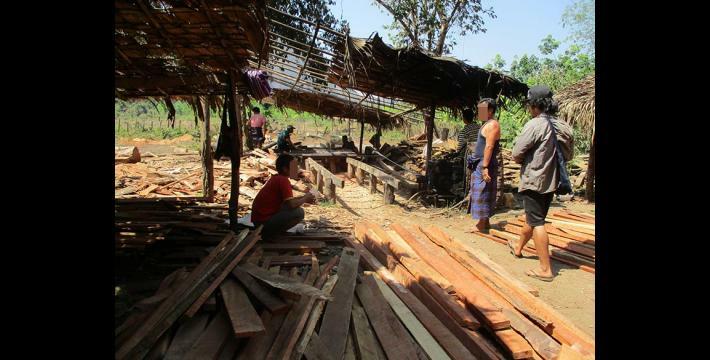 They collected 50,000 kyat [USD 32.14] for each wood cutting machine. On March 7th 2018, the Tatmadaw five trucks worth of rations and weapon to Yo Klah army camp. They transported one truck of supplies to Lay Kay army camp. 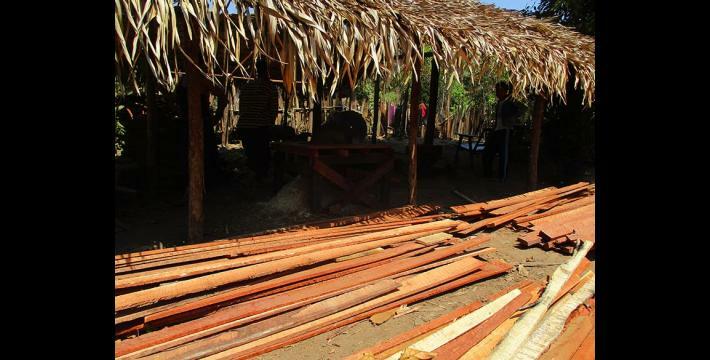 Despite this, most local community members are content with the current situation because of the reduction in violence, threats, and land confiscations. The Tatmadaw continues to operate checkpoints between the P’Nweh Klah and Lay Kay army camps. They stop civilians, question them, and register their names. Communities remain worried about the possibility of tension between the two groups, because the Tatmadaw does not have a good relationship with the KNU and the Karen National Liberation Army (KNLA). However, they doubt that fighting will break out again. In 2018, drug users in Bilin Township, Thaton District were arrested by the KNU. The KNU does not have the means to test for drugs. Therefore, the KNU relies on information provided by the community. [This is considered sufficient to prove guilt for drug use and drug trafficking.] The KNU gathered drug users and traffickers to tell them about the danger of drugs, and to fine them. They then released the drug users and continued to monitor their actions. In early 2018, KNU Township and District leaders opened up opportunities for local villagers in Bilin Township to cut trees in order to build their houses. Many people did not have the equipment necessary to log trees, and asked wealthy businessmen for help to rent wood cutting machines. In return, wood was delivered to Bilin town. When the KNU government learnt that a large amount of wood was being transported to Bilin town on March 9th 2018, they revoked the logging permit for the entire township. The information received from the field suggests that rural communities believe their access to education and healthcare has improved. They are more confident in their ability to earn their livelihood, and think that political stability has increased. Rural communities benefited from development projects that supported their community. However, as this report outlines, rural communities continue to face human rights abuses. Tatmadaw checkpoints and arbitrary taxation continue to threaten their livelihoods and limit their fundamental freedoms. Villagers also worried because the tensions between the Tatmadaw and ethnic armed groups remain in other Districts.